Valentine themed Memory Box craft die featuring a circle full of pinpoints with heart inside. Poppystamps craft die featuring a circle of hearts. Memory Box/Poppy Stamps craft dies are made of 100% steel. For use on cardstock, felt, and fabric. Cut, stencil, emboss, create! Use in most leading die cut systems. Love themed craft die featuring an umbrella with hearts. 1.5 x 1.8 inches, 3.8 x 4.6 centimeters. Poppy Stamps craft die featuring a snowman and hearts. 4.5 x 2.3 inches, 11.4 x 5.8 centimeters. 3 piece die. The large heart is a double-cut die, meaning the solid heart falls out, and you can use the outline of the heart too. Use the LOVE plate as a negative die, or the fallout letters on their own. Approximate measurements: Double Cut Heart: 2 1/8" X 2", LOVE: 3/4" X 3/8". Cupid's arrow has hit its mark! Straight from the Heart includes a single perfect heart and accent arrow. 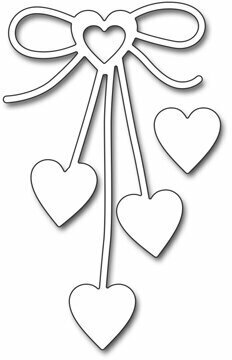 Parallel slots allow you to neatly slide the die-cut arrow through the heart's center for an accent fit for Valentine's, wedding cards, or any occasion that celebrates love. 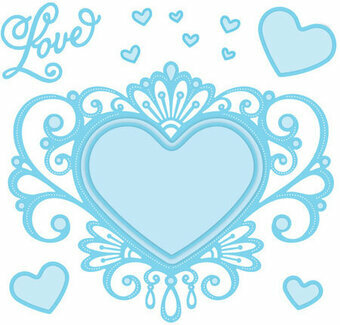 The Straight from the Heart Die-namics features a heart measuring 2" x 1 3/4". MFT Die-namics, our very own exclusive American-made line of steel dies. Sue Wilson Dies - Fillables Collection - Jewelled Heart. Create a fillable heart for your card or layout with this die set. Includes smaller hearts so you can make your own confetti for a shaker card...Perfect for those you love anytime of the year! 7 dies. Size: Smallest: 0.60" x 0.50", Largest: 4.69" x 3.78". An elegant collection of high quality steel dies designed to coordinate with each other. CottageCutz craft die featuring a Swinging Monkey, and hearts. All of the CottageCutz metal dies are universal, easy to use and add great detail to any craft project. They are compatible with most brands of die-cutting machines. Adapters and shims may be required on some machines. Use with paper, cardstock, vinyl, vellum, adhesive-back paper and more. Made in the USA and 100% lead-free. These 24 sheet packs include 2 each of 12 different designs and coordinate perfectly with our line of exclusive card stocks. The 6" x 6" size makes these papers ideal for card making but equally fitting for creating accents and embellishments for a variety of paper-crafting applications. Valentine themed Memory Box craft die featuring a heart wrapped in ribbon. Cheery Lynn Designs Shaker Card Making Kits contain an assortment of tools you need to start creating shaker cards. Craft die featuring a heart with an EKG line. All of the CottageCutz metal dies are universal, easy to use and add great detail to any craft project. They are compatible with most brands of die-cutting machines. Adapters and shims may be required on some machines. Use with paper, cardstock, vinyl, vellum, adhesive-back paper and more. Made in the USA and 100% lead-free. Wedding themed craft die featuring "Mr and Mrs" with hearts. All of the CottageCutz metal dies are universal, easy to use and add great detail to any craft project. They are compatible with most brands of die-cutting machines. Adapters and shims may be required on some machines. Use with paper, cardstock, vinyl, vellum, adhesive-back paper and more. Made in the USA and 100% lead-free. Darice Embossing Essentials Die featuring heart and star shaped buttons. Cut shapes, emboss detail into die-cut shapes and stencil through the die for added effects! Compatible with the Provocraft Cuttlebug, the Quickutz Revolution, the Craftwell eBosser, the Sizzix Big Kick and the Sizzix Big Shot (each sold separately). This package contains one die-cut embossing stencil. Love and Wedding themed craft die from Sara Davies featuring a detailed and intricate heart. This pack includes 2 metal dies which can create 3 designs. The Cut on Edge dies work as a Create-a-Card and have been developed to be used in a variety of ways. First the Cut On Edge concept allows you to use the dies in the same way you would use an edge'able and create a gorgeous edge for your card base. Second, the Cut In concept with the detailed die only to create stunning designs to cut into your card. Finally, there is the Cut Out concept using all three dies. Create a stand alone piece to add to any craft project. Compatible with all die cutting machines. 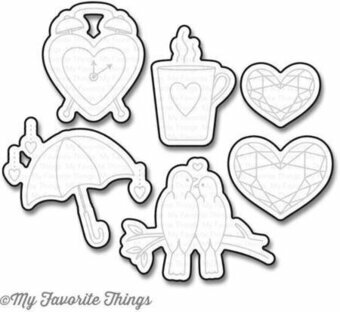 This 6 piece set includes: Clock 1 1/8" x 1 3/8", Mug 7/8" x 1 3/8", Umbrella 1 5/8" x 1 1/2", Lovebirds 1 3/4" x 1 3/8", Small heart 7/8" x 3/4", Large heart 1 1/8" x 1". MFT Die-namics dies are our very own EXCLUSIVE, American made line of steel dies. Die-namics dies work with most tabletop die cutting machines such as the Big Shot & Cuttlebug. Item # MFT-479. Die-Versions die featuring a Vintage Heart Locket. Die-Versions are thin, chemically-etched dies, made in the USA. They are compatible with most die-cutting systems like Sizzix, Spellbinders, Cuttlebug and Quickutz. They are designed to cut cardstock, vinyl, vellum, foam, thin chipboard, cork, metallic paper, felt and more. Each die comes with a piece of ejection foam. Marianne Design Do what you love. This paper block includes very trendy designs in black and white. A5 size: 4 x 8 designs. These dies will add a fun design to any of your paper crafting projects! Dies can be used with most die-cutting machines (sold separately). This package contains Double Stitched Hearts: five dies measuring between 1.125x1 inches and 5.25x4.125 inches. FabScraps-Silver Embellishments. Complete unique jewelry, mixed media projects, jewelry boxes and so much more with these fun embellishments! This package contains twenty 3/4x3/4 inch embellishments. Design: Heart Bench. Contents may vary. Imported. These dies will add a fun design to any of your paper crafting projects! Dies can be used with most die-cutting machines (sold separately). This package contains Heart Borders: five dies measuring between 0.5x5.625 inches and 0.75x5.625 inches. Penny Black Creative Die featuring a bow with hearts. Paper House Boxed Photo Overlay Card Set: Heart Confetti. Insert your photos into the cards for a customized look. This package contains six 4 1/2" x 6 1/2" cards and envelopes. Life would be much more interesting, and any occasion much more dramatic, if we simply used more Confetti to express our jubilation, don't you agree? But real confetti can be time consuming to sweep up afterwards. That's why this Heart Confetti photo overlay card with gold foil details is a much better choice. Express your love, and wishes of good health with our Heart Heartbeat line die. The die measures 6" x 1.625". Our Frantic Stamper Precision Dies work in most consumer table top die cutting machines such as the Cuttlebug, Big Shot, vagabond, Boss Cut, and Grand Calibur. This die is compatible with all the popular die cutting machines such as the Cuttlebug, Big Shot and Vagabond die cutting machines. The die provides a strong clean edge, fine details and will allow you to take your two-dimensional projects to the next level by creating 3D elements that literally jump off the page! Size: 1 3/4" x 2" (44mm x 51mm). This set includes 5 durable maze shapes that nestle into our Heart Shaker Pouches to create a perfect fit. Add a maze sphere and attach to your card for an interactive look that will delight kids and kids-at-heart alike. Me & My Big Ideas-Soft Spoken Themed Embellishments: Heart Mom. A fun and unique addition to all your scrapbooks, cards and more! This package contains five embellishment stickers on one 5-3/4x4- 1/4 inch backing sheet. Imported. Delicate and detailed, yet hip and trendy, and perfect for inlaid die cutting, the Heart of Gold die creates a stunning centerpiece for your projects. This die is compatible with all the popular die cutting machines such as the Cuttlebug, Big Shot and Vagabond die cutting machines. The die provides a strong clean edge, fine details and will allow you to take your two-dimensional projects to the next level by creating 3D elements that literally jump off the page! Size: 2 1/2" x 1 1/2" (64mm x 38mm). Heart shaped tags with a hole for attaching ribbon, twine or a fastener of your choice. Package includes both white and kraft, 10 of each for 20 tags total.